The Production and Management Faculty was established in 1995 in Trebinje. Teaching process is conducted in two study programs at first and second study cycles. 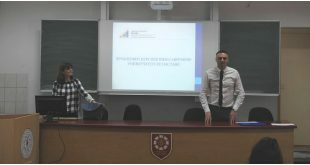 Contemporary theoretical and practical forms of teaching process are aligned with the Bologna model and the quality assurance system at the University of East Sarajevo. Competence of graduates of the Faculty have been confirmed in practice in the areas of engineering, energy, management and other fields. The Faculty has a modern research laboratory, unique in the region. The Production and Management Faculty realizes intensive scientific research through national and international projects, particularly through bilateral mobility projects for teachers and students. Excellent cooperation with similar faculties in the region within the inter-university cooperation agreements has been developed. The Faculty organizes scientific conference "Mathematical Conference of Republic of Srpska", and it is the co-organizer of the international conference IRMES. In cooperation with the Ministry of Science and Technology of Republic of Srpska, the Production and Management Faculty organizes the event "Researchers' Night". Students’ representative body of the Faculty is the "Association of Students of the Production and Management Faculty Trebinje."